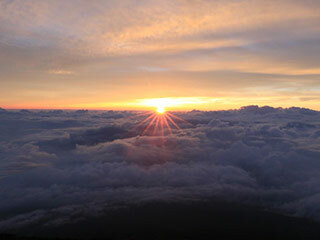 Goraiko, or the Great Sunrise at the top of Mt. Fuji, is the most popular events of the summer break in Japan. Because of the high altitude, you can see the sea of clouds under your site and the beautiful sunrise coming from there. There are two ways to see Goraiko. You can stay at the mountain hotel and leave in the mid-night to reach before the sunrise. Or, You can start climb up Mt. Fuji and make it to the top before the sunrise. It will be very easy to stay at the mountain house and climb up because you can have a break. The sunrise happens around the early 4 a.m. in the begining of July, around 4:35 by the end of July and getting later and later toward to the end of August. Note: Especially on the weekends, there will be the heavy traffic just before the top of Mt. Fuji. So, you might need to add the extra time to reach the top, otherwise, you might not be able to make it before the sunrise. The direction of the sunrise will be a north-west side of Mt. Fuji. So, if you came from the south route, you have to travel to the north side to see Goraiko.